The final report of the LEANWIND project is finished and can be found here! The executive summary can accessed here. The support structures and substructures necessary for offshore wind farms construction, deployment and decommissioning phases need to be improved. Among other objectives, this set of activities aims at ameliorating the temporary stability of structures during the deployment phase, designing new types of gravity bases to reduce installation time and at finding innovations concerning the seabed preparation. Extreme wave testing of floating wind energy platform. Watch the video! Primary vessels types that are used for both wind farm installation and O&M need to be more efficient; LEANWIND aims at developing new solutions for vessels currently in use and at designing new vessels - tailored to meet industry requirements. Deliverable 3.4, Executive summary: Novel maintenance vessel, access systems and installation vessels design report. O&M phases in the offshore wind farms are crucial. Procedures need to be optimised, especially in the far-shore, in deep water and other more exposed locations. This package of activities also wants to reduce OPEX costs by improving condition monitoring and remote presence systems, in order to minimize the need for on-site corrective maintenance. 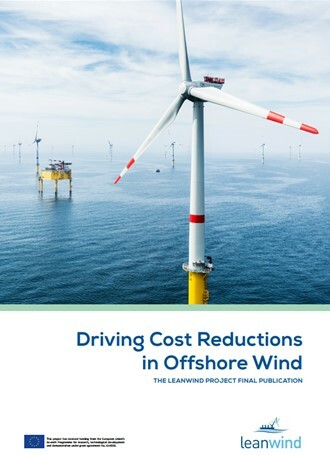 The final cost of energy produced by off-shore wind farms can be reduced by rendering the whole logistics system more efficient throughout the wind farm supply chain lifecycle – from installation and O&M to the decommissioning phase. The use of lean principles will help in defining the key industry challenges, analysing the separate parts composing the offshore wind supply chain – such as on-land transport and ports- and optimising them. In July 2014 the first results will be available. The new results achieved by the project need to be placed in an economic context. LEANWIND demonstrates that system optimisations and technology innovations have direct cost-saving benefits from which the whole wind industry will benefit. Offshore wind business and economic models that may encourage new sources of investment need to be examined. Moreover, the aim of the Economic and Market Assessment phase is to develop a commercialisation and implementation strategy that will ensure LEANWIND’s solutions to be effectively implemented.